Thousands of residents and visitors spent a gorgeous Sunday afternoon enjoying the second annual Braddock Park Art Festival, held on June 12. Among the hugely popular activities were an artist market, live artist demos in graffiti alley, audience participation projects/lessons, hands-on fun for kids, a community mural project, steamroller woodcuts, and much, much more. 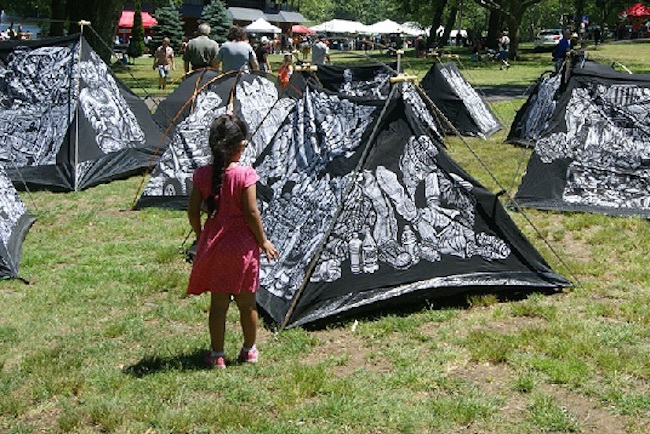 Art installations and booths covered the sprawling lawn at the southwest end of the lake around the lake house, while musicians and singers entertained on the grass and in a bandshell stage. Attendees also enjoyed delicacies from an array of unique and exotic food trucks ringing the traffic circle. Freeholder Anthony Vainieri, Mayor Nicholas Sacco, and Commissioner Julio Marenco (pictured) along with numerous other town and local officials, spent the afternoon welcoming residents to the daylong celebration of the arts. The event was organized and coordinated by Guttenberg Arts, and sponsored by Hudson County Executive Thomas DeGise, Freeholder Vainieri and the Hudson County Board of Chosen Freeholders, the Hudson County Office of Cultural & Heritage Affairs/Tourism Development, and The Hudson County Division of Parks. Click on the link below to view photos from the event.